I had some friends over for a crafty afternoon on Sunday. 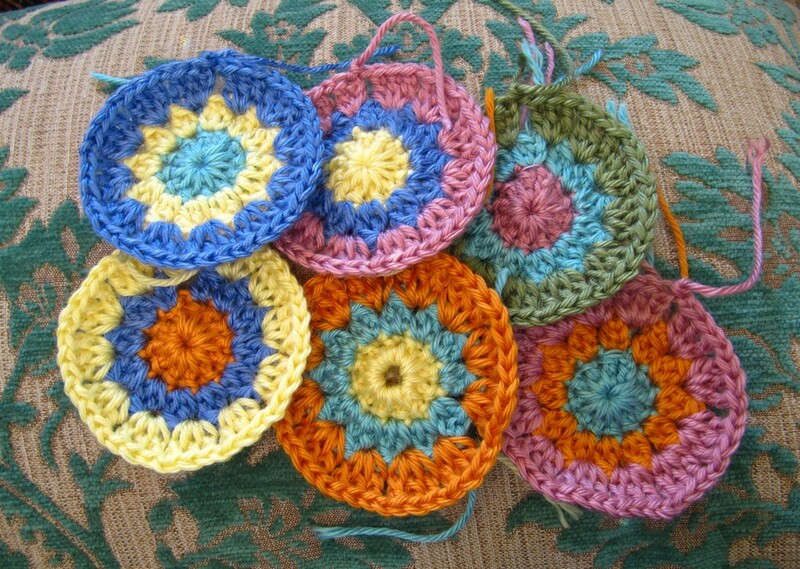 I set about crocheting the round parts of what will eventually be hexagons in between chatting, consuming tea and eating cake and before I knew it, I had six! I’m trying to do them in random colours which is a challenge for me (instinctually I make everything symmetrical and in patterns), but I’m happy with how they’re looking thus far. I’m still aiming for throw rug, but they could end up as a cushion or runner instead! These are made using Attic24’s hexagon pattern. oooh! Fun! I love how quickly you start building a little platoon. Very satisfying. To make sure I’m making them “random”, I use all color combinations of all 4 yarns I have. It’s a bit tedious, but I’m not much for free-form either, so when I realize I’ve done them all, it’s like solving a puzzle. To make a blanket though, I’ll need to make about 6 sets of all the different combos.